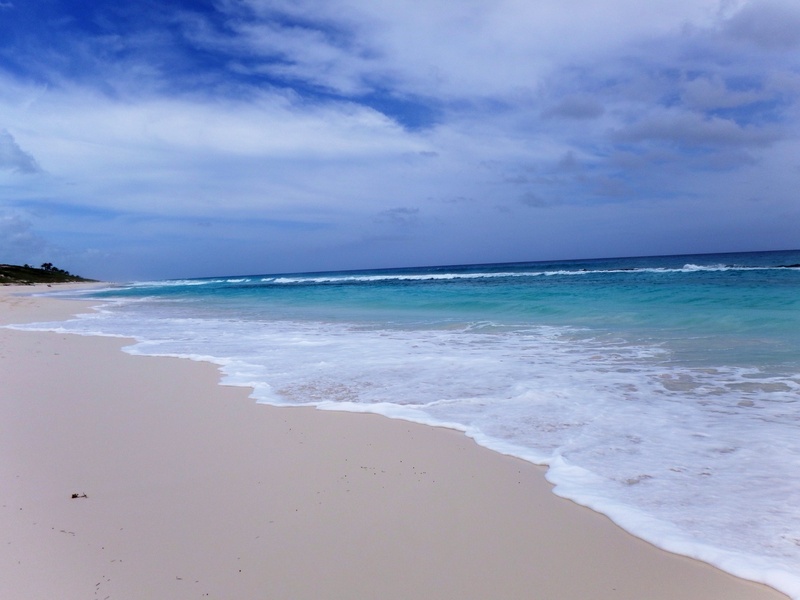 What is better than walking on a long sandy beach with clear turquoise water to wade in or swim through? The sky here is usually bright blue, there is often a breeze or stronger wind, and the temperature at this time of year is always around 80. It’s hard to believe but EVERY stop we make in the Exumas has at least one, and often several gorgeous beaches next to where we anchor. The water is clear and warm, the sand is soft and the beaches are almost always free of debris. They are usually free of other humans too, and if people are walking on the beach, there are never more than a handful. Every beach is dog friendly and of course no leashes are needed, although we do bring one to control Sailor if/when other people pass by us. All beaches in the Bahamas are public. Some of the more than 500 islands in the Exuma chain have been sold to celebrities and wealthy people, but even Oprah has to let us use her beach up to the high tide water line. It’s the law. In the Exumas, there are two types of beaches. The calmer, smaller beaches are on the “bank” side, the inside of the islands. We are always anchored on this side. 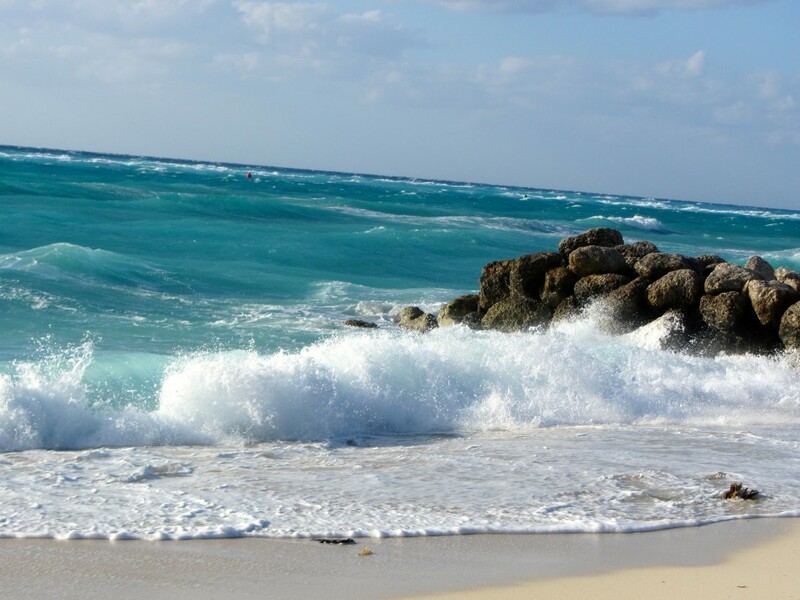 The water is shallow and usually very calm so these beaches are perfect for swimming. Of course, the soft sand is on the sea floor as well as on the beaches which makes walking out in the water no different than walking on the beach, just wetter. A short hike over rocky hills, often on a trail marked by other cruisers takes us to the Sound beaches. (The “marks” are varied, including conch shells, rocks, cloth tied to branches, and even old sandals.) These beaches are bordered by high rocky hills which can be climbed for dramatic views of the Sound. 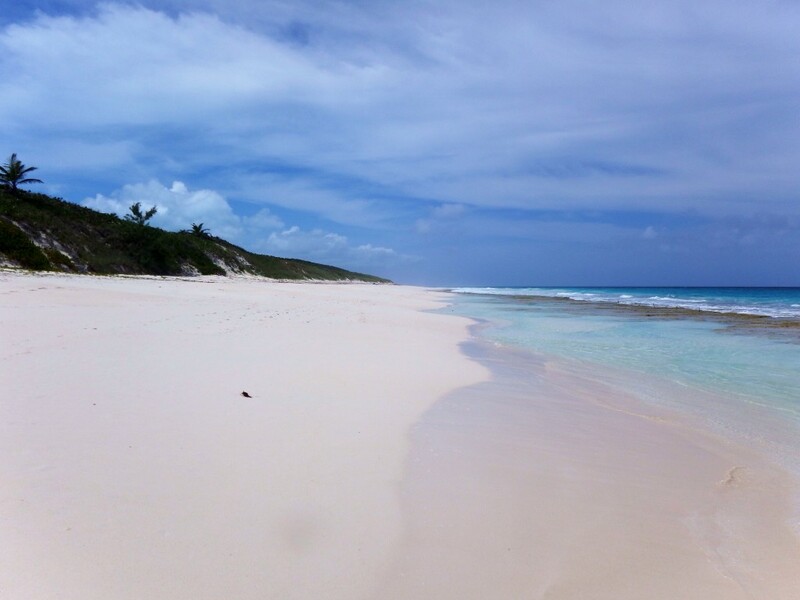 The beaches are often as far as you can see, deserted, and covered with soft, white sand. 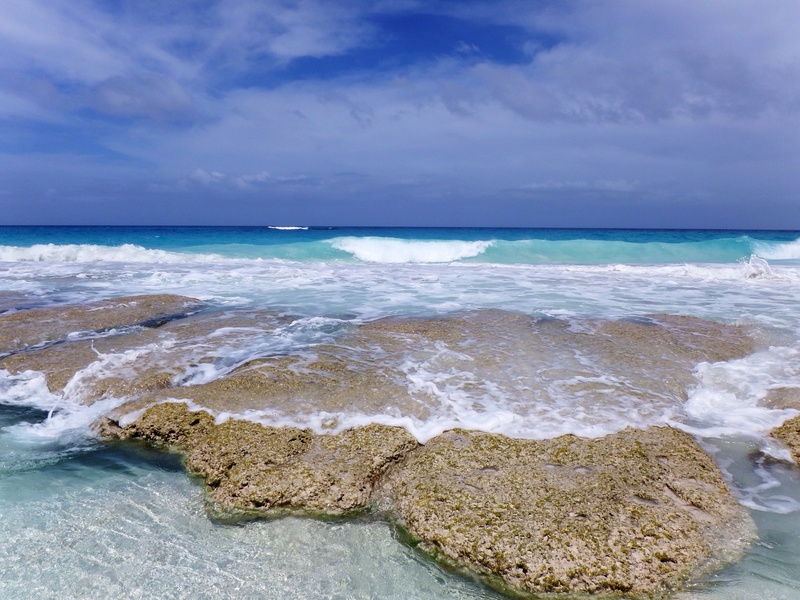 Waves crash over reefs close to shore, but in some parts there are calm areas where you can safely swim, almost like ponds in the water. The Sound beaches are breathtaking because the water offshore consists of shades from light to very dark turquoise, depending on the depth and floor of the sea. There might be sand, rock, reefs, or grass underneath, which affects the coloration. Pictures being worth a thousand words, below are some I took today while on a beach walk on the Exuma Sound side of Georgetown. Pictures in the previous post were at a beach on the Elizabeth Harbor side, where we are anchored. To get to the beach on the Sound we ride a short distance to a very small stretch of harbor beach where we leave our dinghy, throwing the anchor up on the beach. If it is high tide, we put the anchor out in the water so we don’t come back to a dinghy sitting on a beach when the tide goes out. We climb a rather steep rocky hill up and then down on the other side to the beach you see in the photos below. Although the trail is steep, there are branches and sticks deep in the ground to grab for support so it is quite safe. Today we walked for several hours along this stunning beach. This entry was posted in 2013 - 2014 Bahamas Cruise, Bahamas, Beach and tagged Georgetown on March 29, 2014 by Jan.
People have mixed feelings about Georgetown in the Southern Exumas. Some cruisers love it and spend the entire season here. Others come for Regatta when there are lots of activities and then leave. Cruisers who don’t like crowds totally avoid coming to Georgetown because there are usually hundreds of boats here, spread out over numerous anchorages, but still a lot of people. Yet, it is quiet and it is possible to find a place to anchor by yourself. Georgetown is a small town with many facilities a cruiser needs. There is a well stocked grocery store, the Exuma Market, as well as another smaller one. These are the only grocery stores in the Exumas that aren’t in houses. There are several banks, places to get fuel and propane, a Customs and Immigration office where you can either check in or extend your stay in the Bahamas. Restaurants, rental cars, bus excursions, a Batelco (phone) store, a computer shop, laundromats, a cell phone store, various small shops and much more are available. A pumpout boat comes through the anchorages three times a week and new this year there is a trash boat. 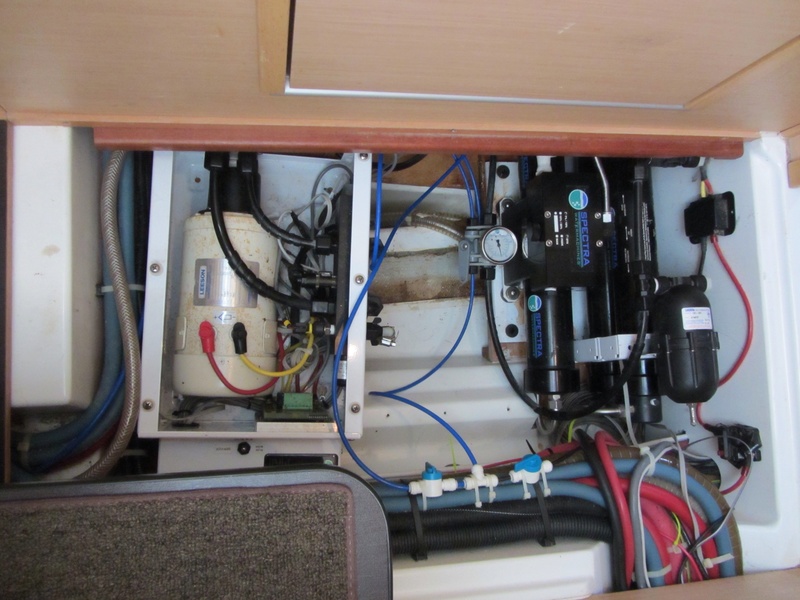 This is the first year that cruisers in Georgetown have not had free garbage disposal. Instead there are several ways to get rid of garbage, all for the cost of $2 a small bag and $3 for a large one. Water is free and there is always a line at Exuma Market on the dinghy dock where cruisers fill five gallon jugs to bring back to their boats. Even though we have a watermaker, we still get some free water from town. It’s RO (reverse osmosis) water, and very good. Every morning at 8 am there is a “cruisers net” on the VHF radio. You get to hear the weather, local businesses advertise, and cruisers can come on to try to sell or give away things, share rides to the airport, ask for help, etc. At the end of the net, people are invited to introduce themselves if they just arrived or say goodbye if they are leaving. Since we arrived here eight days ago, we have walked on several beautiful beaches on the Exuma Sound side and the harbor side. We have played Mexican Train with friends and eaten dinner at the St. Francis. We’ve gone swimming several times at a beach called Flip Flop. We also went with ten other cruisers to Flip Flop Beach one late afternoon for sundowners. Today we went to a talk by a local historian who shared information for more than an hour about the Bahamian culture. Normally by the time we get to Georgetown, we need to purchase food and perhaps get money from the local bank ATM, but since we came here so quickly we don’t need anything yet. Tonight we had BLT’s with tomatoes from our “garden” and every morning I have fresh picked strawberries with my yoghurt. 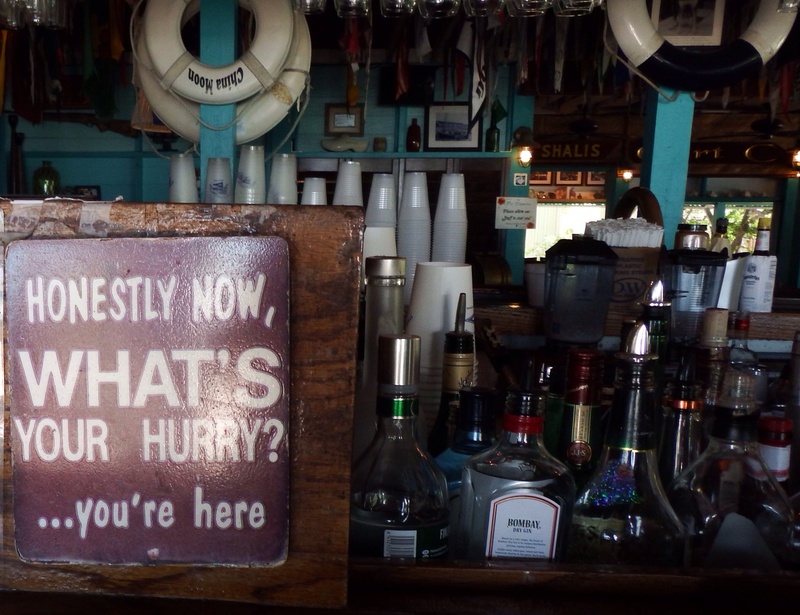 We’ll probably stay here until the end of March and then start heading north through the Exumas, very slowly. If the weather cooperates, we’d like to spend a few days in Long Island, a short sail south of here before heading north. 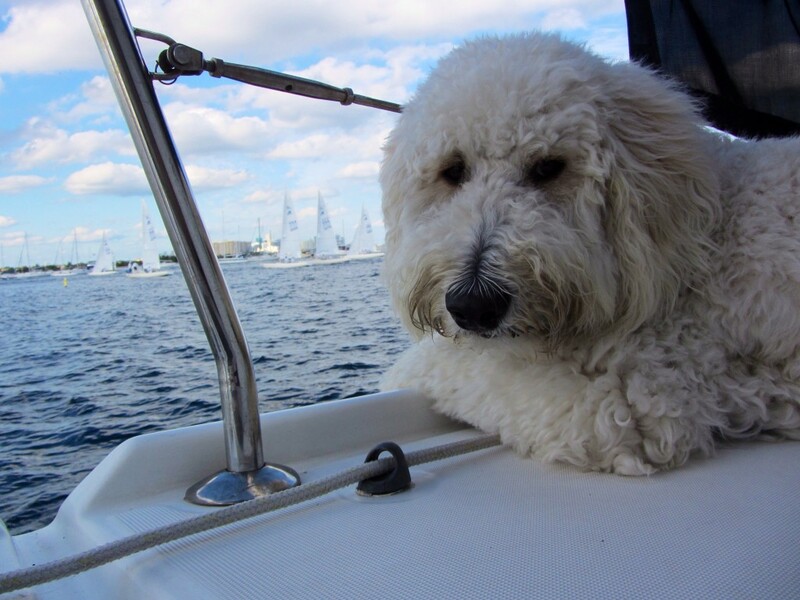 Unfortunately, Sailor does not like us to leave him alone on the boat, and he LOVES riding in the dinghy. So we are taking little steps to let him know it’s OK if he isn’t always going with us. Mark has gone ashore alone a few times and Sailor is adjusting to that, although he does stare towards where Mark went until he returns and whimpers a bit. Just as he learned when we were at the dock in Stuart that we will return, he’ll eventually learn that here too. We have discovered that he loves to swim. He swims out to us and then swims back and forth between us “letting” us hold him while he rests. Our anchorage today was so still there were no ripples in the water. In the photo below you can actually see the sandy bottom. We also saw a (harmless) five foot long nurse shark swimming by our boat. 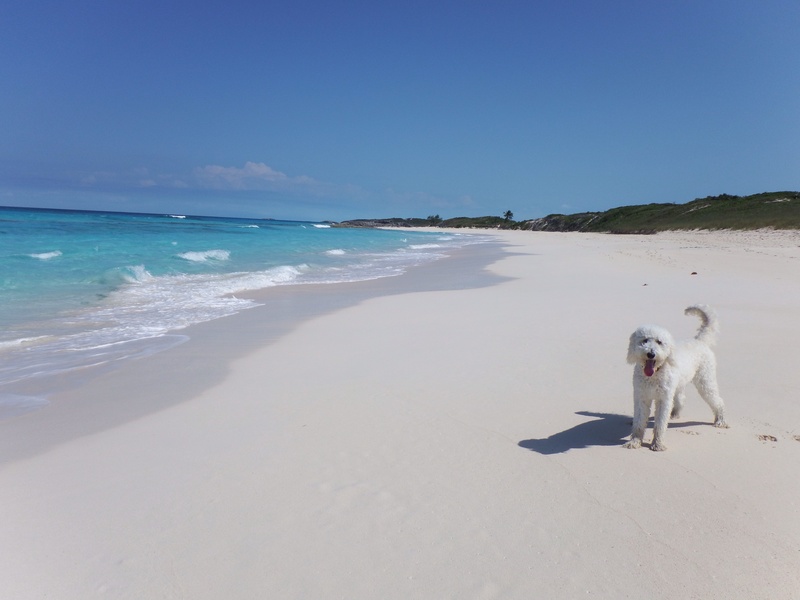 The Exuma Sound beach here is usually deserted with lots of room for Sailor to run off leash and for us to walk. We usually swim on the harbor beaches where there are no big waves. 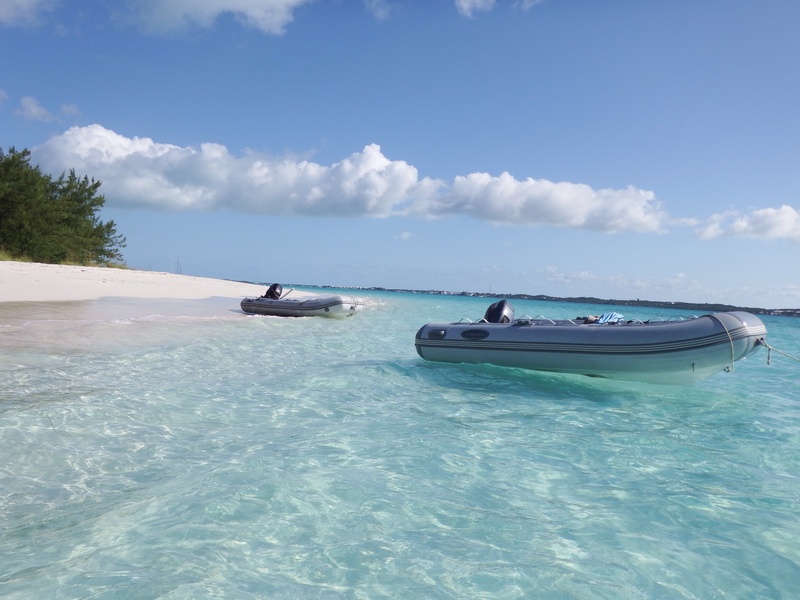 In the Bahamas, our dinghies are our “cars” and below our dinghy and our friends on Interlude’s dinghy are anchored while we swim nearby on Flip Flop Beach. In the distance are buildings in Georgetown, across Elizabeth Harbor. This entry was posted in 2013 - 2014 Bahamas Cruise and tagged Exumas, Georgetown on March 23, 2014 by Jan. Normally the leg from Staniel Cay to Georgetown would take us at least two days, maybe three if we stopped in Blackpoint. But this time we did it in one day. It took 8 1/2 miserable hours. The first hour was fine, on the bank to south of Big Farmer’s Cay. Depths are about 10-12 feet on this part of the trip and the water was very calm. Then we had to decide if we would anchor near there or go out into the Sound which is hundreds of feet deep. We heard from another cruiser who had just gone out Galliot Cut. She said it was horrible, but once you got out, the Sound was fine. The cut was in a rage, wind and current in opposite directions and huge waves from all directions. It didn’t look good, but we figured it would be a few minutes of being in a washing machine and then OK. But it wasn’t. When we got out in the Sound the waves were high and we were going into them. It was like riding a roller coaster for the next seven hours. We made good time at 7.5 kts with the jib barely out and the mainsail reefed. Without doing this to the sails we would have been going too fast. Sailor was not happy and he stayed with me in the salon. We alternated between the couch and the floor because it was impossible to stand without falling. I had put most things away, but I could hear every cupboard and closet having its contents knocked around. We finally reached Georgetown, in the south Exumas, and were surprised to see how many boats were still here. Regatta was early this year, in February, and when we got here they had already done the Long Island Rally and were back. Still all of the anchorages were filled. We went to the Sand Dollar anchorage and spent two rocky nights and days there before moving down to Monument. Now the wind has dropped and we are comfortable. In Georgetown some boats move from anchorage to anchorage depending on the wind direction but unless we are going to be very uncomfortable we stay in one place. When we arrived the entire boat was covered with salt, not just salt water but chunks of salt. We did something we rarely do and gave the boat a fresh water wash. Our deck hose can use either fresh or salt water but this called for something very clean. Everything got washed, and inside the boat it took hours to put everything away and straighten up the messes in closets and cupboards. We have a rule that we don’t sail to a schedule and we don’t sail in bad weather. The weather was fine, very sunny, but the wind was strong and not favorable to the direction we were going. I would rate this as our worst day on the water. We never should have gone in those seas. We will stay here for a few weeks, maybe go to Long Island. There is a lot to do here, including a great beach on the Sound for walking and lots of little beaches on Elizabeth Harbor, where we are anchored, for Sailor to chase balls. When we go north we’ll travel slowly and stop at places we missed coming south so fast. Just before we left Staniel Cay, I ran out of data on my iPad. It is very easy to add voice or data to a phone, but for a tablet the procedure is difficult involving taking the SIMM card out, putting it in a phone where the slot is three times as big so the iPad card doesn’t fit in the slot and making some phone calls to add data, then putting the card back in the iPad. I thought I could do it myself this year and in the process ruined one phone. Luckily I had another old phone so I could use it to talk to my daughter Jennifer back in Florida every night. There is a Batelco office in Staniel Cay but we left the day I realized I needed help. That was Saturday and although we arrived in Georgetown that afternoon, Batelco offices didn’t open here until Monday. Today we went into town and a nice Batelcto person got the data on my iPad card and we are good to go for another 2 GB’s. Even with the bad experience, Sailor still seems to enjoy sailing and especially going ashore in the dinghy. Below are pictures of him retrieving a ball in deep water and running on a beach bringing the ball back to Mark. He is just learning to like to swim and the retriever part of him is having a great time. This entry was posted in 2013 - 2014 Bahamas Cruise and tagged Bahamas, Georgetown on March 17, 2014 by Jan.
We had a pleasant sail from Nassau to Shroud Cay, staying there one night and then sailing to Staniel Cay arriving Tuesday afternoon. We immediately found a spot in a protected anchorage by Fowl Cay since a front was on its way to the Central Bahamas. There are quite a few boats here, most probably heading north. We, however, want to go south and can’t leave until the wind calms down. There are lots of advantages to being in Staniel Cay, although it is not our favorite place to stay. For a cruiser, there are plenty of anchorages to move around to when the wind shifts, however there are also always other boats with the same intentions. There are three stores, all quite small. Two are just rooms in private homes, called the Blue Store and the Pink Store, and yes the houses are painted those colors. Isles General is a little larger, but still only two small rooms on the first floor of a home. A large boat brings supplies once a week, but we didn’t need anything this time. There is good snorkeling here, mainly at Thunderball Grotto, a cave where the movie Thunderball was shot. In fact, that is Staniel Cay’s claim to fame. Of course, there are the swimming pigs, but once you’ve seen them you rarely go back. They live on part of Big Majors and come out to your dinghy begging for food. 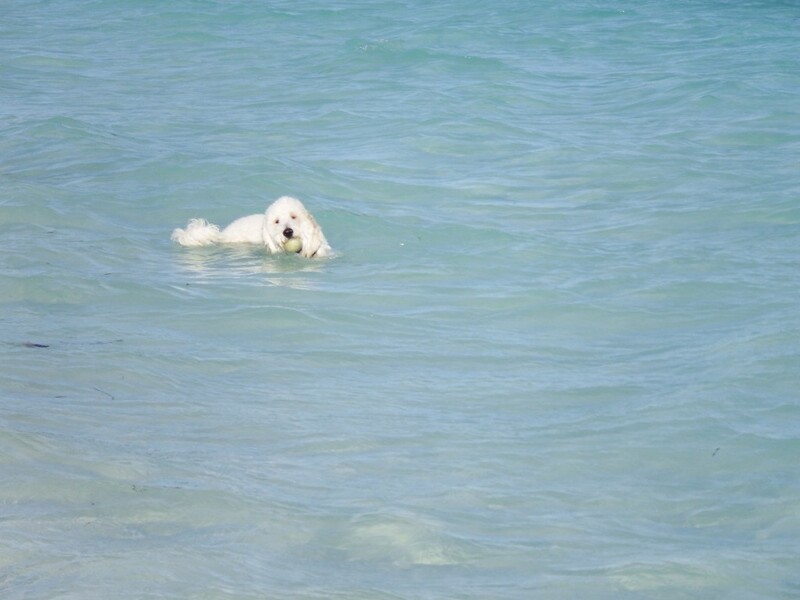 There are a number of small beaches, suitable for swimming, going ashore with a dog or to socialize, but not for any distance walking as they are all small. There is no real access to beaches or walking on the Exuma Sound side. 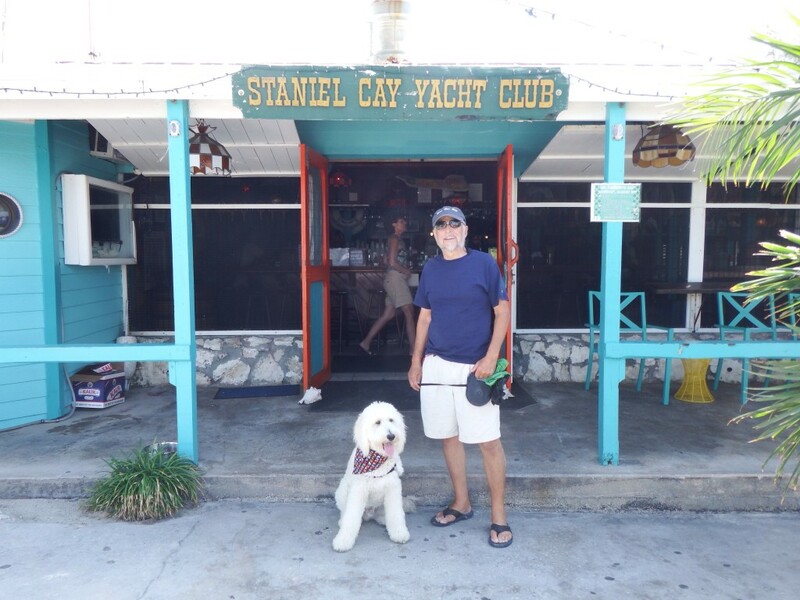 Overall, it’s a convenient place to stop and the people who stay here for extended times are here to socialize with friends on boats or at the Staniel Cay Yacht Club. It’s called that, but really is just a marina with a restaurant. There is also a fuel dock which many cruisers use to replace fuel used on the way here. We find the food there OK, but on the expensive side for the quality. For a special occasion splurge, there is a restauarnt on a separate island/resort called Fowl Cay. It is five star and has a nightly gourmet meal with a price to match. This is a great destination for people not on boats who want to visit the Exumas as there are a few cottages on Staniel Cay and some luxurious ones on Fowl Cay. 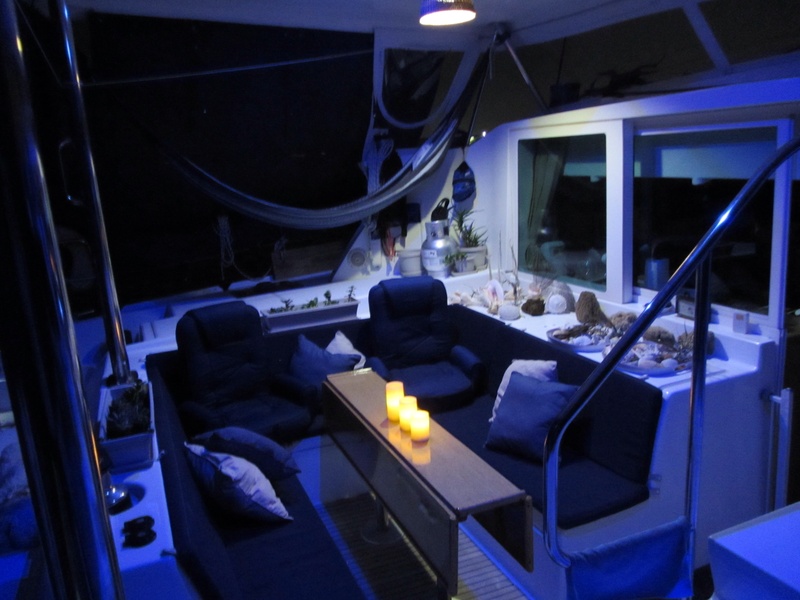 There is a dive boat ready to take you snorkeling or diving on nearby islands. Also, Staniel Cay has a good airport and flights arrive daily from Nassau and Ft. Lauderdale, as well as private planes. Cruisers often have guests fly in here. We are trying to get to Georgetown, about two days from here, to meet up with friends on Interlude, Cathie and Tom. We will probably leave tomorrow, but as always moving around in the Bahamas is very weather dependent. Tomorrow looks like a good day to sail south but on the second day we have to go out into the Exuma Sound, aka the ocean, and the wind will be from the southeast and seas probably higher than we are comfortable with sailing in. However, if we don’t leave tomorrow, another front is coming through early next week and stalling in this area. When you are in the Bahamas, you resign yourself to listening to the weather every day, either to move to another anchorage if a strong front is coming through and you need a different protection, or to move on to another island. Right now, some people are looking for good weather to return home to the States. Sailor has had a fun time here. He’s had several romps on the beach with a poodle named Luke from another sailboat. He’s also learned to swim! Or, I should say he knows how to swim but now he seems to be comfortable with it. He retrieves balls from water over his head, no more than 15 feet offshore and will do this as long as someone will throw the ball for him. He races up and down beaches and gets lots of exercise. He usually “goes” on the trampolines before his beach visits, so he’s there mainly to play. He loves riding in the dinghy, so the whole shore trip is fun for him. Of course he gets full of sand, so he is learning to swim before getting back on the dinghy and then he gets washed down with salt water from a hose when he gets back on the boat and then has a shorter fresh water rinse. After all this he brings little sand back onto the boat. Sailor also found a new way to get on the boat. One day I opened several hatches to catch the breeze and he investigated one over a guest cabin bed. A screen was pulled across the opening, but that didn’t stop him. He fell through it onto the bed and then promptly settled in for a nap as if that was his plan all along. Below are a few photos from the last few days. This entry was posted in 2013 - 2014 Bahamas Cruise, Sailing and tagged Staniel Cay on March 14, 2014 by Jan.
From the first day Sailor moved aboard Seas the Day with us last September, we worried about him falling through the lifelines. Many people with small dogs put woven rope all around their boat on the lifelines to keep their dogs from falling through. When he was small, Sailor was never alone on the deck. As he grew we figured he was too big to fit through between the lifelines. At Sunset Bay, our hurricane season port in Stuart, FL, we occasionally left him alone on the deck for anywhere from a few minutes to a few hours. (We couldn’t leave him inside because he gets frustrated and rips up paper and other items but he was fine on the deck.) He totally ignored people who walked by unless they came over to pet him. He mostly slept while we were gone. Our deck was usually about five feet above the dock and he had to get off on a ramp we put up and took down whenever he got off the boat. 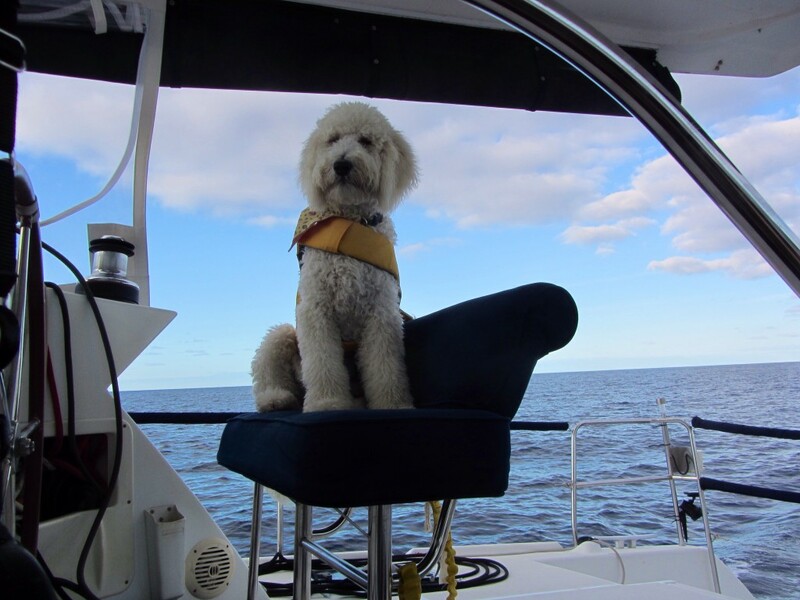 When we started moving through the water a few weeks ago, sailing south, we never let him on the deck without his life jacket on and tethered to the helm seat if he was outside while we were moving. 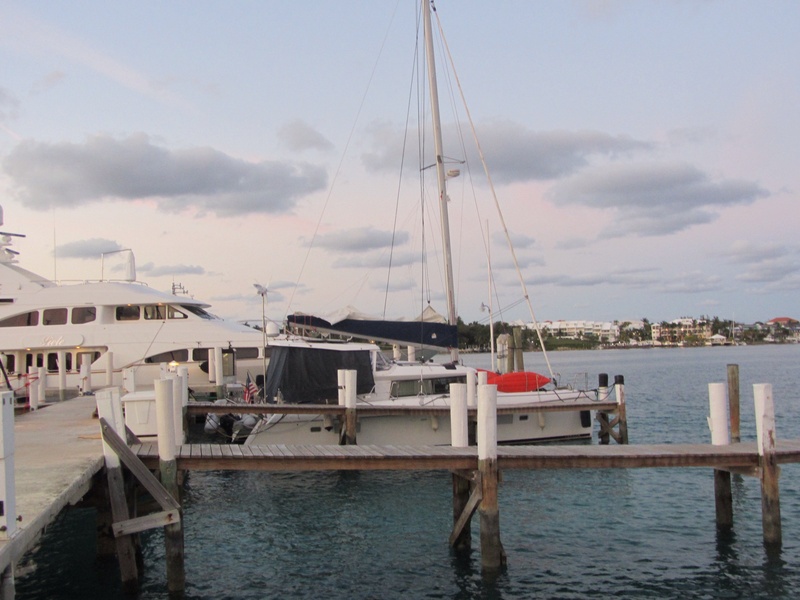 All went well until we got to Nassau and were at the Nassau Harbor Club. The dock was almost level with our deck, making it very easy for Sailor to get on and off but when we undid the lifeline gate he wouldn’t jump down by himself so Mark had to lift him on and off when we took him for a walk. We didn’t leave him alone on the boat. Sailor has always been very alert to noises. He often growls softly to alert us if he hears someone walking by the boat in the middle of the night. He can be in a deep sleep anytime and wakes up if he hears something strange. He is always looking around and listening, no matter where he is. However, he has never been afraid of noises. When the very loud fireworks started he first ran out on the deck and then came right back, seeming to be very nervous. We went out on the deck to see what was going on and he followed us, but ran back inside. We watched the fireworks show for a minute or two and I went back in the cabin to see what he was doing. Sailor wasn’t inside! At that moment we saw the marina security guards coming down the long dock towards us. We were in the very last slip. They said they saw our dog racing down the dock and he had fallen into the water. We ran down the dock and saw exactly what had happened. The dock stops abruptly and turns at a right angle with a short span of water ahead between the dock and the shore. I’m sure he was running so fast he couldn’t stop and went flying into the water. He may not have noticed the dock ended. It was low tide and there were about six feet between the dock and the water. Sailor was dog paddling around the wall, but there was no way for him to get out without help. Mark climbed down a ladder and called Sailor over to him. Marinas always have ladders down to the water in numerous places on their docks in case someone falls in or has to get down to the water. Sailor swam over to Mark but it was impossible for Mark to climb the ladder with a 45 pound dog. Three men were there to help, along with me. Mark let go of the ladder, took Sailor in his arms and swam to the next dock where a small fishing boat had a low platform at the back. The water was shallow so Mark could bounce his feet off the bottom. He lifted Sailor onto the boat and another cruiser staying at the marina lifted Sailor onto the dock. Sailor was totally traumatized. By now the fireworks were done but he would not come back to the boat with us. We figured out later that he must have thought the loud noises and light flashes were on our boat. Sailor is extremely attached to us and he would never choose to leave us. Not wanting to drag him down the dock, Mark carried Sailor all the way back to the boat. We rinsed the salt water off him, dried him with towels and wrapped him in a blanket. I sat on the floor with him, held him tightly on my lap, and tried to comfort him. He shivered for about an hour, long after his body warmed up, staring out the door. The water actually wasn’t very cold and we worried that he could be in shock. Finally he stopped shivering, but could not relax. 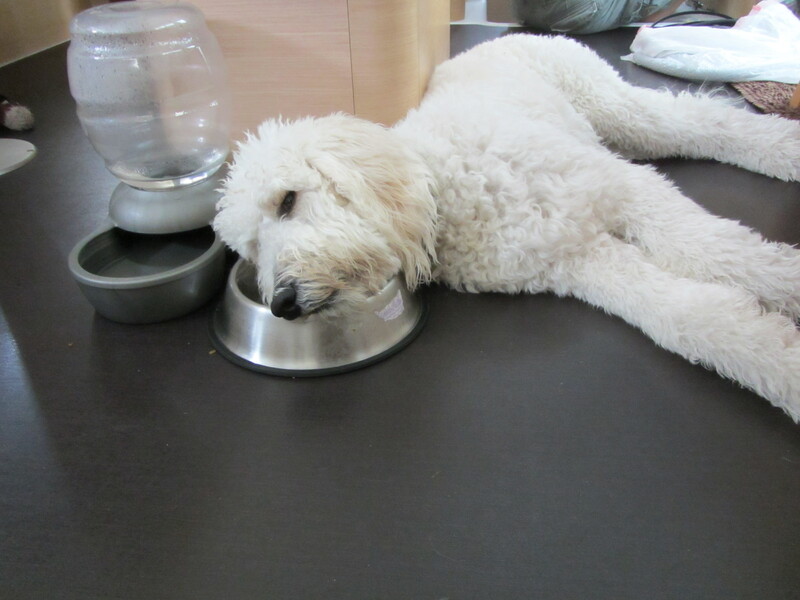 Mark slept in the salon with him and by morning he ate his breakfast and was almost back to his happy self. We were leaving that morning for the Exumas and water was part of our dockage fee, Mark was washing the salt off the boat. Unlike marinas in the States where water is free, you pay for it almost everywhere in the Bahamas. I got off the boat to walk across the street to buy some groceries, locking the lifeline gate behind me. Shortly after I left, a cruiser came walking down the dock and said to Mark, “I have something for you.” Mark looked and saw Sailor trotting down the dock next to him. We suspect he knew he could get off the boat by squeezing between the lifelines and went looking for me. 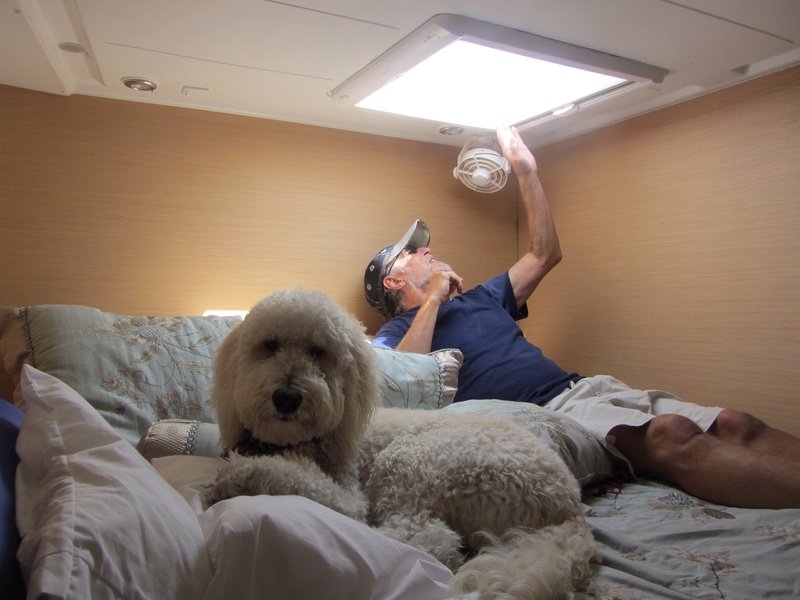 Until the previous night, Sailor had never gotten off the boat without our assistance. Fortunately there is no way to get out of the marina unless you can open a door that goes out to the street and he hasn’t learned to do that…….yet. Of course, this was very scary for us. 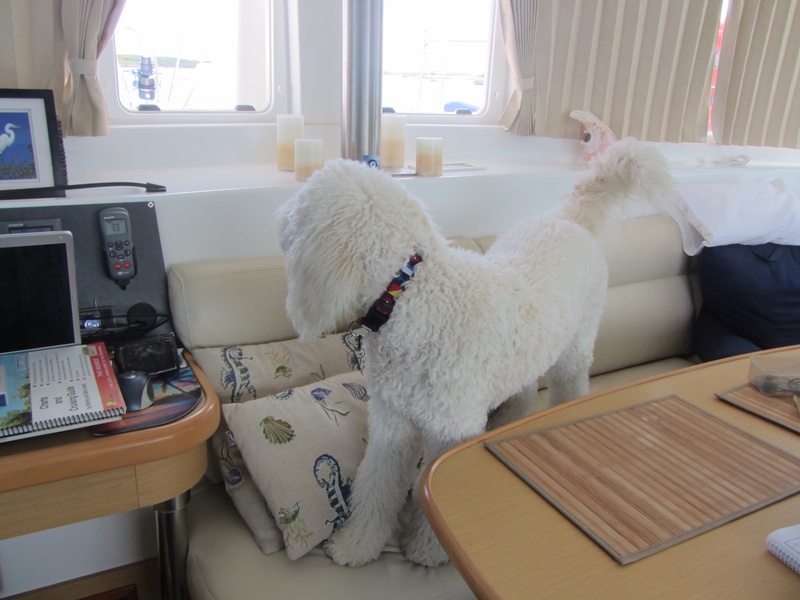 We were lulled into thinking Sailor would not get off the boat without us. After living on it for six months he had never even tried to jump off. We can only assume he saw the opportunity because it was level with the dock, even though he had to squeeze through the lifelines. Fearing the very loud fireworks sound, he was no doubt terrified enough to do anything to escape. At the time we thought he was inside and other than hearing the sounds, we didn’t know he was afraid of them. The second episode was probably Sailor learning a new “trick” and he wanted to come with me. We thought we were doing everything possible to keep Sailor safe, but it wasn’t enough. We are extremely fortunate that there was no way to get to the street on the day he tried to follow me because no doubt he would have run right in front of a car. After being traumatized by the fireworks sound, Sailor is now afraid of our Shark cordless vacuum. Today while I was vacuuming up sand he brought in from the beach, he jumped up on the couch and left by the window. Yes, that is a trick our little escape artist has learned. He’s pretty big to be going out the small window, but he manages to climb up on a shelf and out. He comes in the same way! We feel so very fortunate that everything worked out in Sailor’s favor. The security guards saw him go in the water. If not for that, we would have been looking all along the dock and maybe wouldn’t have even seen him if he had swum under a dock. In fact, we might not even have known he had fallen in and we would have looked on the marina grounds. Sailor is adjusting extremely well to sailing. Each day he learns something new. He very quickly learned to love riding in a dinghy. Whenever he hears the dinghy starting to go down into the water, he is at the top of the sugar scoop steps ready to jump in. The first time he was on a beach, in Bimini, he ate sand. He actually put his mouth down into the sand and filled his mouth with it. It made him sick for a few day but he hasn’t injested it again. He learns fast. We know many dogs are afraid of fireworks, but we’ve never owned a dog who was terrified like Sailor obviously is. Some people wonder why cruisers bring a dog on a boat. Sailor is part of our family and we wouldn’t enjoy this experience as much without him. When our wonderful Goldendoodle Daisy died last summer, after living aboard with us for five years, we mourned her, but within a few weeks since we had never not had a dog in our lives, we decided to find another Goldendoodle. In the end, dogs want to be with their people and with some adjustments, they can be just as happy living on a boat as they are in a house. 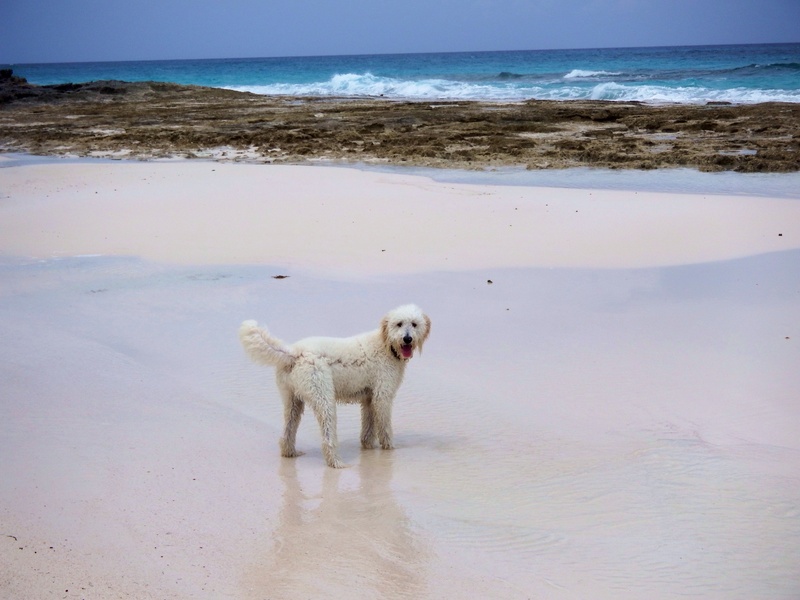 Below are a few pictures of our little escape artist coming in the window and relaxing after running up and down a deserted beach in Staniel Cay, the Bahamas. 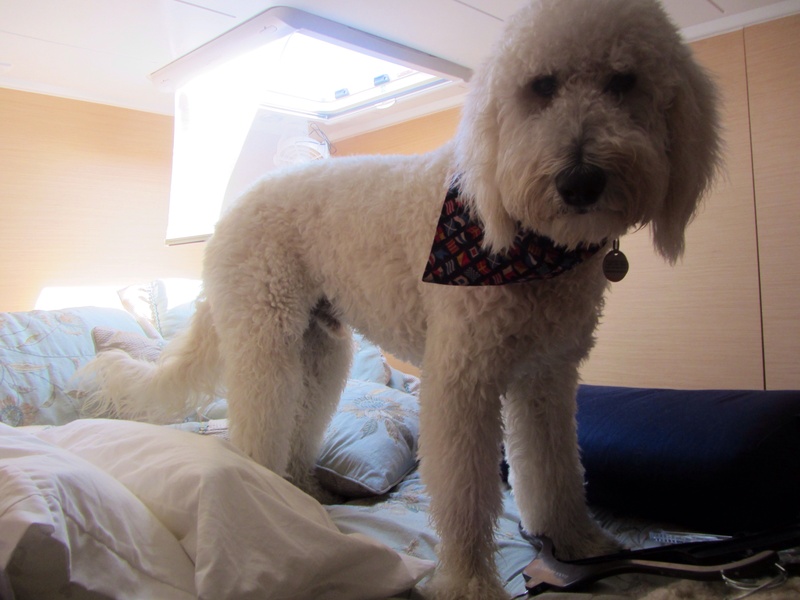 This entry was posted in 2013 - 2014 Bahamas Cruise, Bahamas, Boat Dog and tagged Nassau, Sailor on March 12, 2014 by Jan. 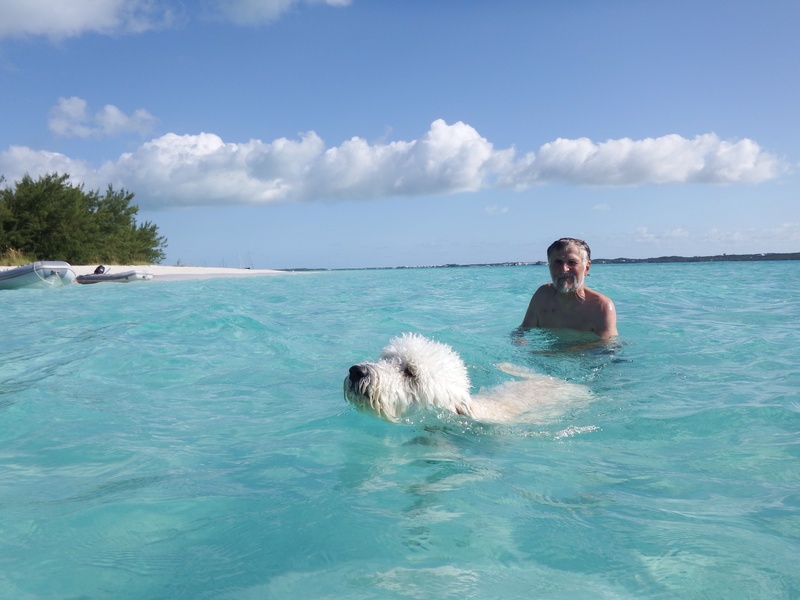 Since the seas in Bimini were about 8-10 feet Friday night, we decided to check Saturday morning when we got up and if the seas were down we could go anchor at nearby Cat Cay, then leave Sunday morning for Chub Cay. However, when we checked at about 0600, the seas were down considerably so we decided to leave. At 0630 Saturday we were on our way. It was a bit rough coming out into the ocean, but when we made the turn and got on the Great Bahama Bank where the depth is under 12 feet, we had smooth seas the rest of the day. When we reached the Northwest Channel Light (there isn’t really a light there but it is marked on the charts) the depth went from 15 ft to 2000 feet within a few minutes because we left the Bank and returned to the ocean. The wind picked up early in the day and we had a perfect beam reach making it possible for us to average 7.5 kts motorsailing, arriving at Chub Cay at 1750 with plenty of daylight left. There is nothing to do on Chub, but Sailor got a walk on a new beach. Daylight Savings Time started today, so we didn’t get started from Chub until 0730 when it was light. Again, the seas were smooth and we made good time averaging over 7 kts. We entered Nassau harbor at 1235 but it was 1330 by the time we got in our slip at Nassau Harbor Club. This is the first time we’ve stayed here because they only have a few slips wide enough for a catamaran. We stopped for fuel at another marina and had to wait in line. Diesel was $5.05 a gallon, which will probably be the norm for the Bahamas. We paid $3.85 in Miami. When we got to the marina they had us back into a very tight slip. We were almost in until we got stuck between posts on either side of the slip. We had told them we are 24 ft 8 in wide, but I guess they don’t measure the slips. We got out and the dock boys directed us to a slightly wider slip which we easily backed into. Power is metered at 60¢ a foot so we will use it sparingly tonight and tomorrow morning. Water is $8.00 for the day. At Bimini Sands it was metered, so we didn’t use theirs. Since we paid for it here whether we use it or not, we’ll give the boat, and Sailor, a good wash. Sailor learned a new trick today. He now goes in and out of the windows in the salon. We haven’t seen him negotiate jumping in and out because he’s sneaky and quick. 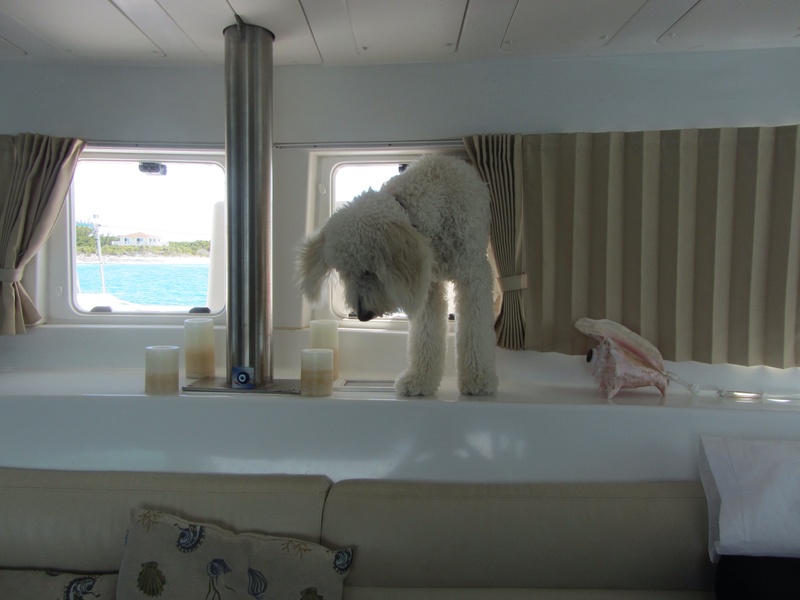 When we are anchoring or coming into a dock, we leave Sailor inside, but he quickly began getting up on the salon couch, standing on his hind legs, putting his front paws on the shelf under the windows and looking out the windows which are usually open. Now, I guess we’ll have to shut the gate AND the windows! 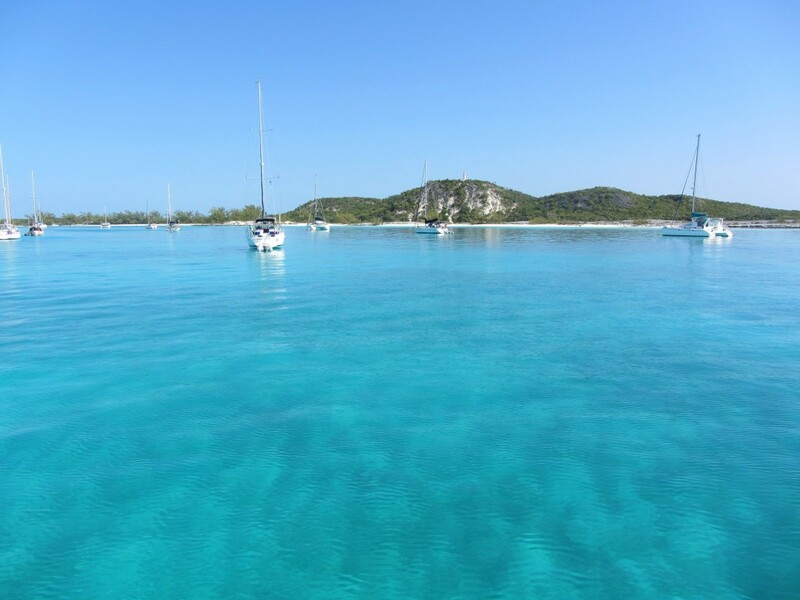 Tomorrow the weather looks good for sailing to Highbourne Cay. Usually it takes us about five hours so we’ll sleep in and leave around 11 am. We’ll be on the Great Bahama Bank again until we go out on the Exuma Sound for a short sail to get to Georgetown. The water is crystal clear and tomorrow we’ll probably see starfish on the bottom. Our destination is the Exumas and tomorrow that’s where we’ll be. 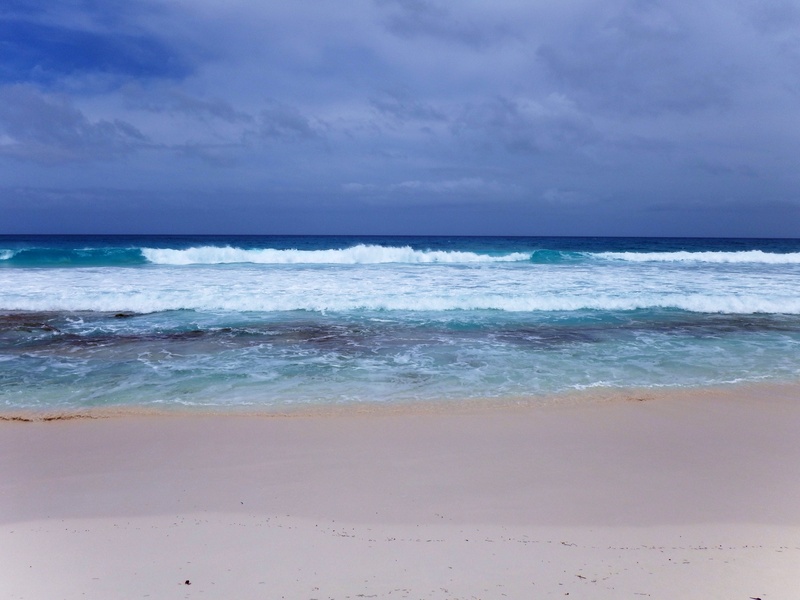 Most of the islands where we stop from now on will have deserted beaches, so Sailor will get to run and maybe swim. Below are pictures from the last few days. Sailor took his watch at the helm. Autopilot on of course so all he had to do was watch for other boats and luckily they were few and far between. Leaving our anchorage at Chub Cay this morning. The small anchorage is on the other side of the land open to the ocean, and many fast boats leaving a marina creating large wakes. 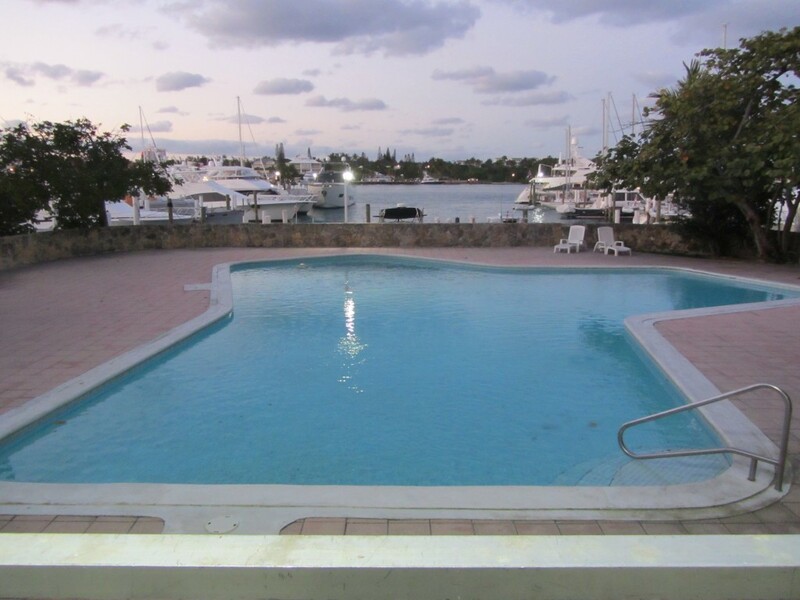 This is our slip at Nassau Harbor Club. A megayacht came in after us. One of the crew members came over and apologized for blocking our view, but we thanked him for blocking the wake from numerous speed boats in the harbor. Then he told us how much he liked our boat and offered to trade his house in Ft. Lauderdale for the boat. 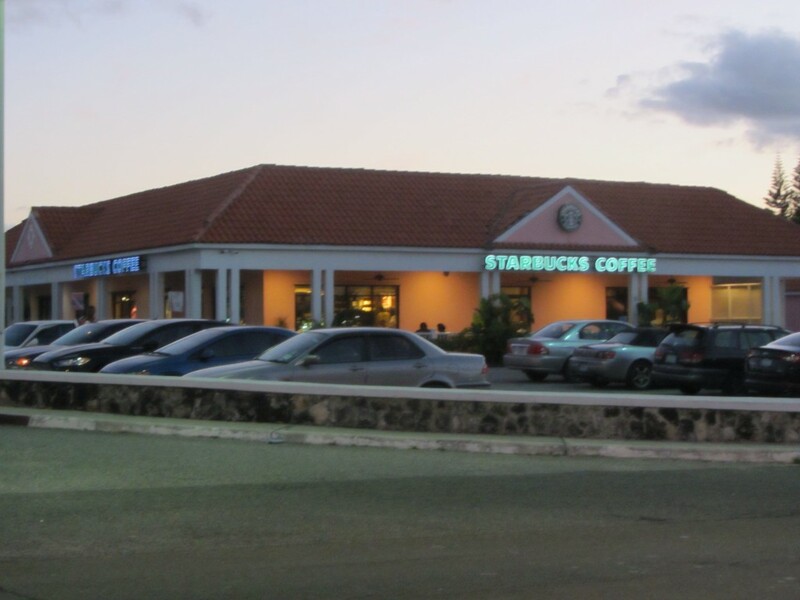 This photo of Starbucks was taken from our marina across the street. Now this is convenient. The only problem is the drinks are $1.00 more than in the States. It’s just a few more steps to the Fresh Market grocery and all the other stores in the mall. This is my second to last frappuccino until June. One more tomorrow than cold turkey! This entry was posted in 2013 - 2014 Bahamas Cruise, Sailing and tagged Chub Cay, Nassau on March 9, 2014 by Jan.
We’ve been in Bimini since Tuesday and today is Friday. The weather had looked good for leaving on Saturday, but the winds have not dropped. They were up to 30 kts yesterday with sporadic rainstorms and dropped to the high teens today. We figured we’d leave before sunrise tomorrow, since it’s a long day’s sail to the Berries where our first stop will be. Then we took Sailor for an afternoon beach walk and this is what we saw. At about 6 pm a 20 ft open fishing boat came into a slip by us. Six people got off with suitcases. I asked one of them if they had been out on the ocean and was shocked to hear they had left at noon from Ft. Lauderdale. He said the waves were 2-4 feet when they left and were 8-10 feet as they came into the marina. Part way over they lost one engine. The boat has two large outboard motors. Personally, I wouldn’t want to come across to the Bahamas in that boat in flat seas. They were soaked and of course thankful that they made it here. A few minutes later they would have had the additional problem of bouncing up and down in the waves in the dark. We’ll get up early tomorrow and check the wind and seas, but I doubt that we’ll leave unless the wind has dropped considerably and the seas are much calmer. We don’t go anywhere unless the sea conditions are very mild. This entry was posted in 2013 - 2014 Bahamas Cruise and tagged Bimini, Sailor on March 7, 2014 by Jan.
On Monday, all systems were go for a change. We did some last minute errands, had a last frappuccino until June (unless we decide to visit the last Starbucks we’ll see in Nassau) and motored over to No Name Harbor. The small anchorage was crowded and the Bay outside was smooth, so we opted to anchor outside the harbor. It seemed like a smart move because we wouldn’t have to worry about someone dragging into us and we’d have an easy time getting out in the morning. Or so we thought. At 0500 we were up and preparing the boat to leave. We had done most of the final preparations the previous nights with everything locked down and ready for a trip across the ocean. Then I went to raise the anchor. We have an electric windlass with a remote control, so usually this is very easy. However, it pulled up very slowly. During the night we had turned with the wind and current and we thought perhaps the anchor had picked up something. We had put out 120 feet in 15 feet of water. When I got to the marker on the chain to 75 feet, a huge piece of cement, in the shape of a cross with four equal arms came up with chain and rope wrapped around it. The rope was not ours, but no doubt from previous anchors catching on it. This was a huge problem. Mark got the dinghy down and with his knife started carefully cutting some of the rope. Then he started spinning the cement around and loosing some of the tight wrapped chain, being careful of his fingers. Suddenly it came loose and dropped to the sea floor. Mark got the dinghy raised and we were off at 0630, an hour later than we planned, but still early. 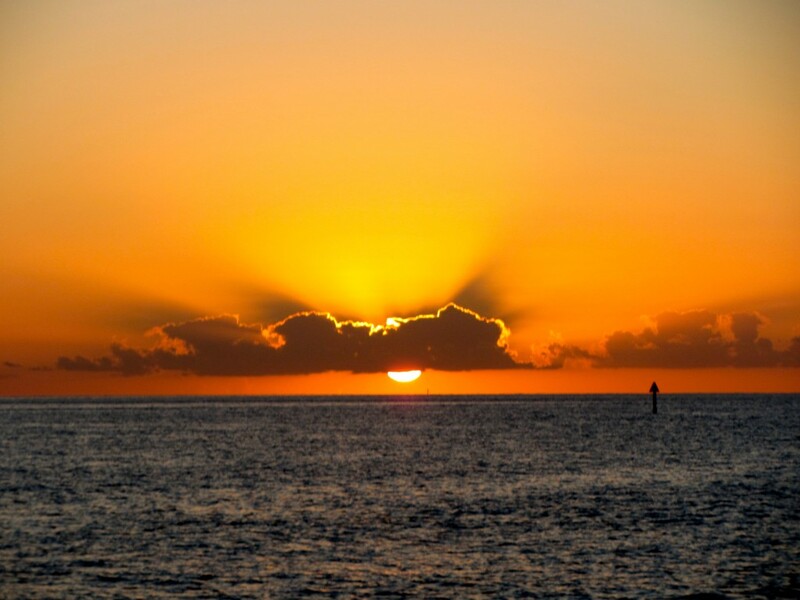 As we headed out to sea, we saw this beautiful sunrise. The forecast was for light and variable winds and seas under two feet, perfect weather for crossing the Gulf Stream. If the wind is out of the north, or very high, it kicks up the seas and creates rough waves. However, as we continued, the wind shifted and were able to sail, averaging 8 knots which is a good speed for us. At 1300 we were safely tucked into a slip in Bimini Sands, a marina and resort in South Bimini. 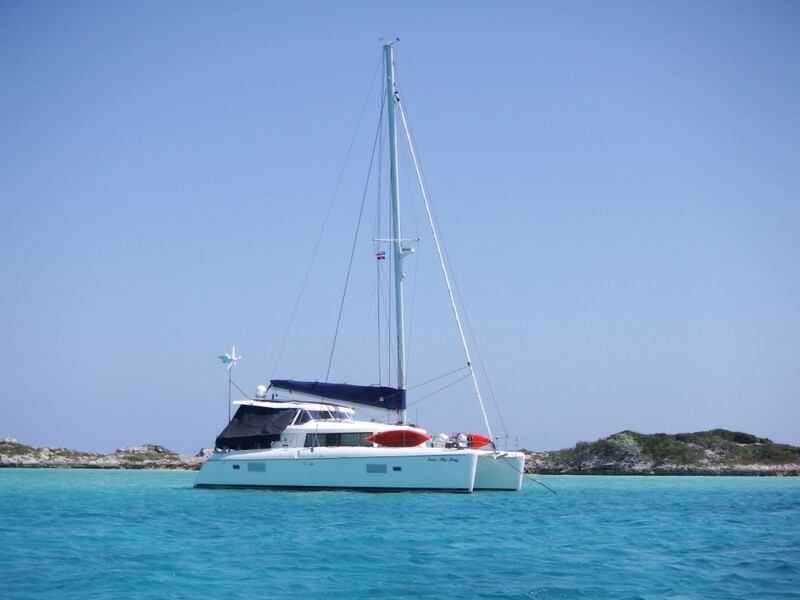 The majority of boats go to North Bimini, which is only a short water taxi ride away. We are paying $1.50 a foot and some of the marinas in North Bimini are around a dollar a foot. However the docks there are rickety and there is a lot of foot and car traffic next to those marinas. 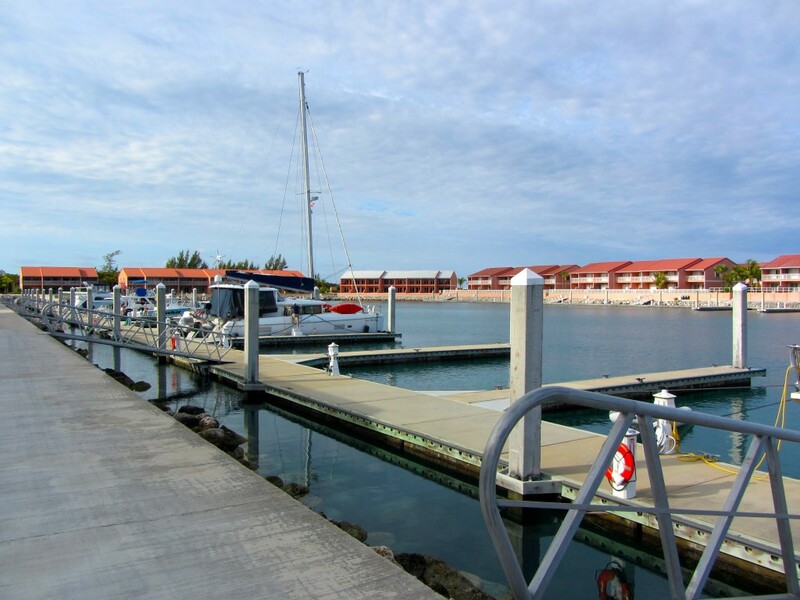 Bimini Sands is very peaceful and quiet, with the marina surrounded by condos, two pools and the ocean beach steps away. We feel like we are in a resort. 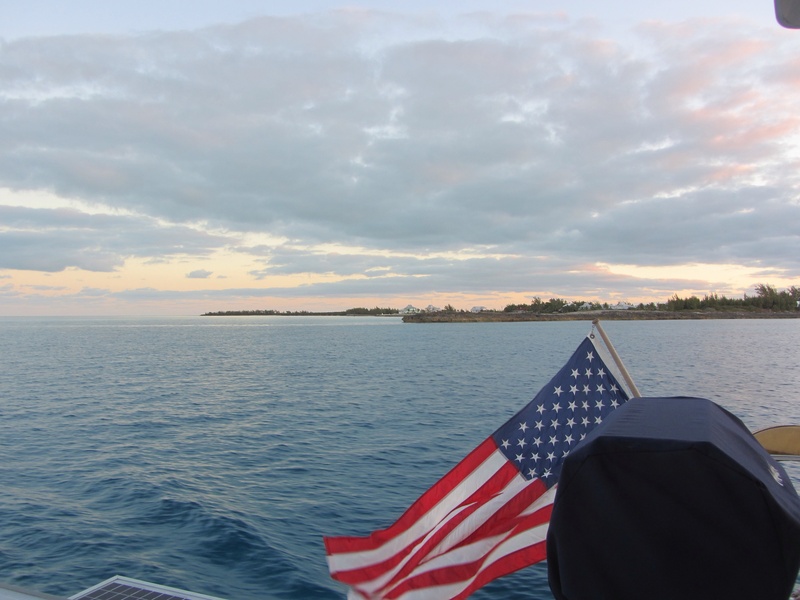 When boats arrive in the Bahamas, you raise a yellow “quarantine” flag. Then the captain, and only the captain, can get off the boat, go to customs and immigration with all our your paperwork, pay the $300 entry fee, get immigration papers for the captain and any crew, and return to the boat. At that time, we raise the Bahamas courtesy flag and we are legal and able to go anywhere in the Bahamas for the length of our immigration permit. We got three months and can renew for another three months for our $300 fee. 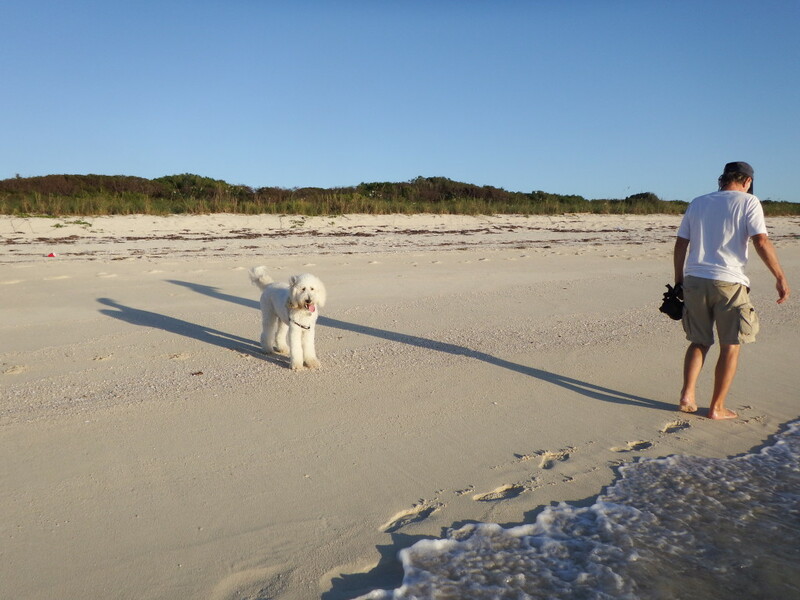 After we got settled in, we took a walk on the beach with Sailor. 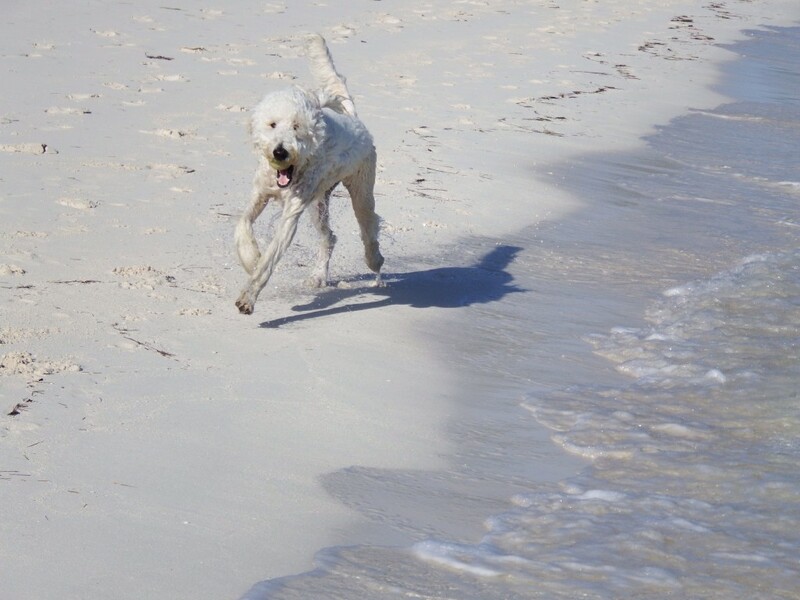 This was his first Bahamas beach walk and since the beach was empty we let him run. He loved it, but didn’t go near the water after his “mistake” at Peanut Island in Lake Worth when he thought he was on sand but ran into the water. Squalls are predicted for the next few days, so we will leave on Saturday headed to Chubb Cay in the Berries, then on to Nassau. Hopefully by early next week we’ll be in the Exumas and start traveling south through the many islands of that chain. In the meantime we will enjoy being in Bimini. 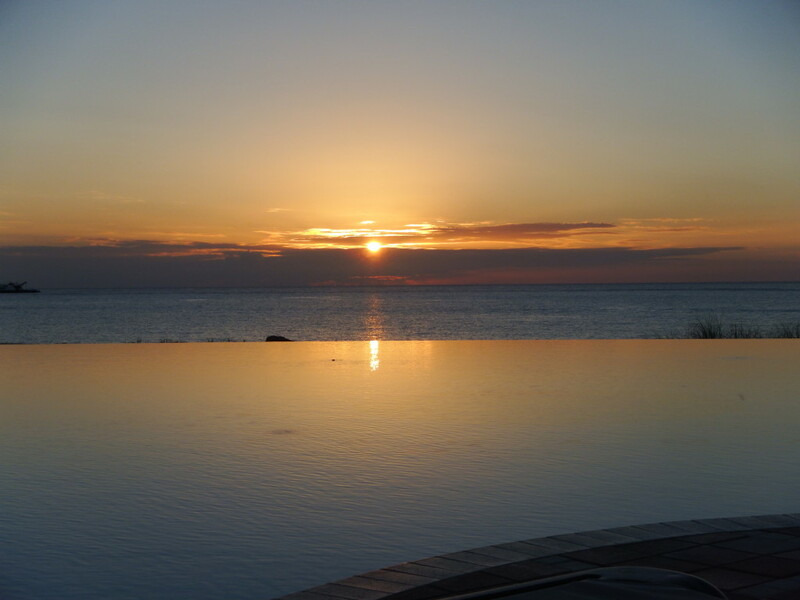 Below we are watching the sunset at the infinity pool, next to the Atlantic. Please check our Facebook page and Instagram site from time to time for updates on our travels. There are links on the top right side of this blog page. Also, on the “location” page of this website, our SPOT track will show exactly where we are as we move from island to island. This entry was posted in 2013 - 2014 Bahamas Cruise on March 5, 2014 by Jan. The numerous delays we’ve had have been annoying, but Mark has managed to finish up lots of small projects. Yesterday he installed LED lights in the cockpit which we can switch from white to blue. They give a nice ambiance to the sitting area and if we need more light we can lower the hanging lamp to see what we are doing on the table, such as playing Mexican Train. 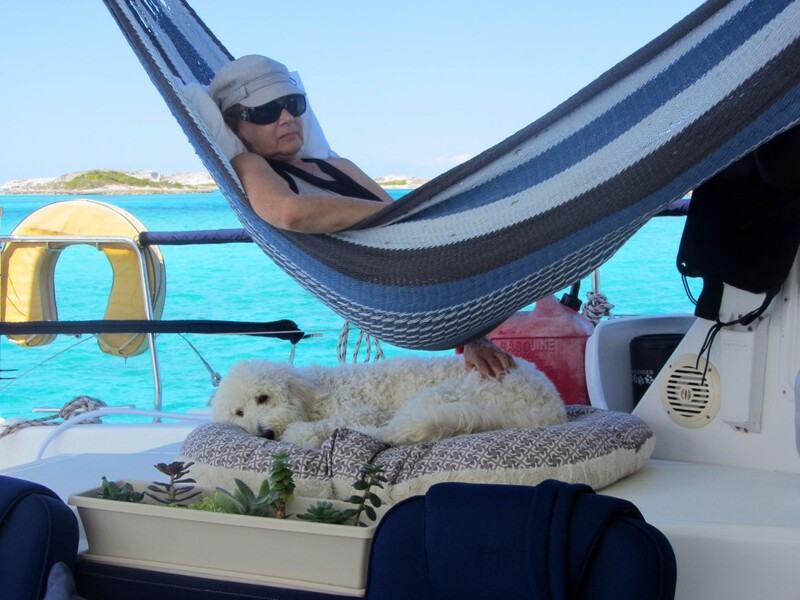 In this photo the hanging lamp is on a hook on the bimini where we keep it when we are sailing or the boat is rocking too much. We have two recessed lights in the roof and are going to add two more. One will go directly over the grill and the other will be centered between the two posts. Yesterday, the Spectra service rep came and repaired our watermater. We needed a new pump and had paid for it to be shipped overnight from California. Mark could have installed it, but was unable to order it himself. Now we are ready to go and can leave during the next good weather window, which should be Monday or Tuesday. Today we plan to do some last minute provisioning and celebrate by going out to lunch at one of the many restaurants in Coconut Grove. 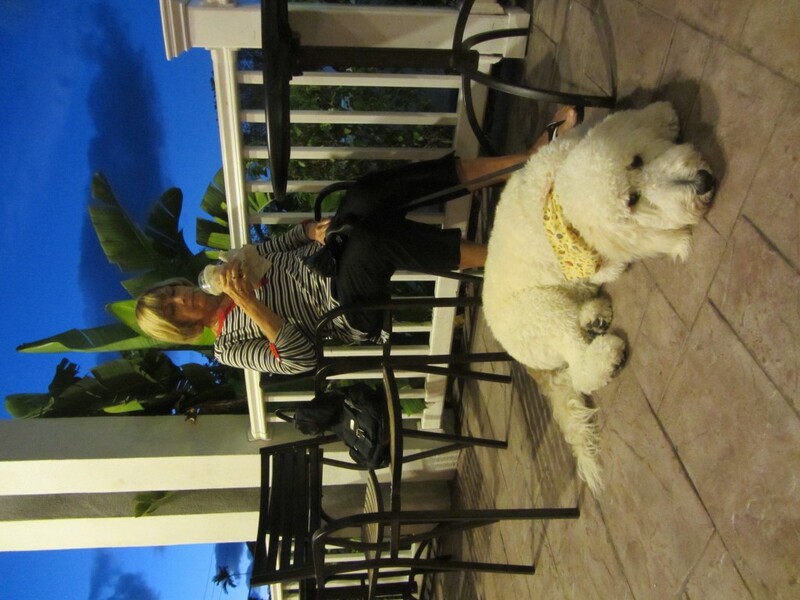 Most have outside seating which means we can take Sailor with us. We don’t quite trust him alone on the boat while we are out in the water. 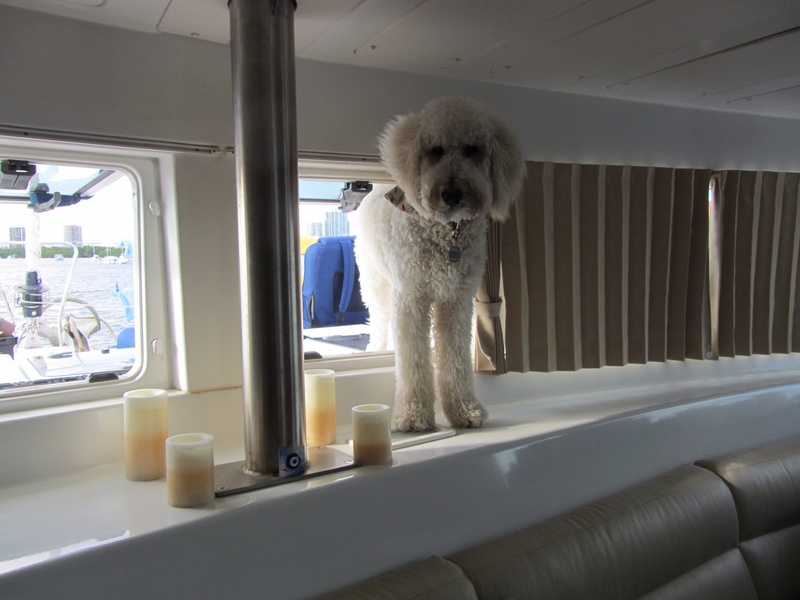 He stayed on the deck in Stuart at the dock for hours at a time when we were gone and never tried to get off the boat. However, he has discovered the thrill of dinghy rides and just might decide to dive in and swim after us if we leave without him. He doesn’t like to swim yet, but being with us in the dinghy might outweigh that fear until he is a little older. As you can see below, he is getting fairly bold. I suppose soon he’ll be using this window as a door since he can already get halfway in. 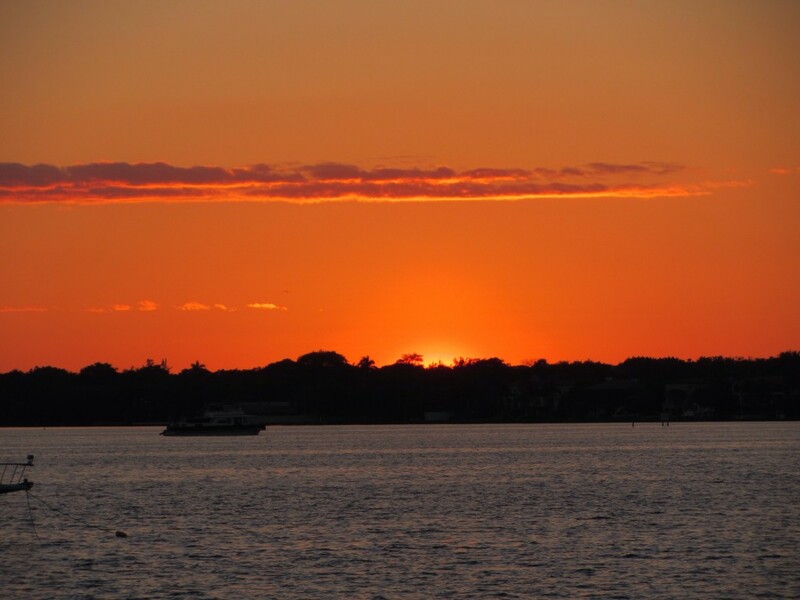 The sunsets are usually lovely in Miami, and last night’s was typical. This morning dozens of sailboats are going out the channel onto Biscayne Bay for races. Sailor finds this interesting but prefers to view it from the comfort of his own deck. This entry was posted in 2013 - 2014 Bahamas Cruise, Florida and tagged Hanging Lamp, Miami on March 1, 2014 by Jan.